Sit in front of the television all day? Today I have been out and about with my friend Lydia, in a bid to bring you a flavour of the jubilee celebrations across the country. I visited the village of Chawton, home for many years of Jane Austen: more of this hereafter. And then we drove to Winchester to join the celebrations on the street. There are flags here from Jane Austen’s house; Winchester Cathedral; Winchester School; pubs, private houses, markets, town halls and village halls. See if you can spot which is which. The people’s jubilee: hot off the press. 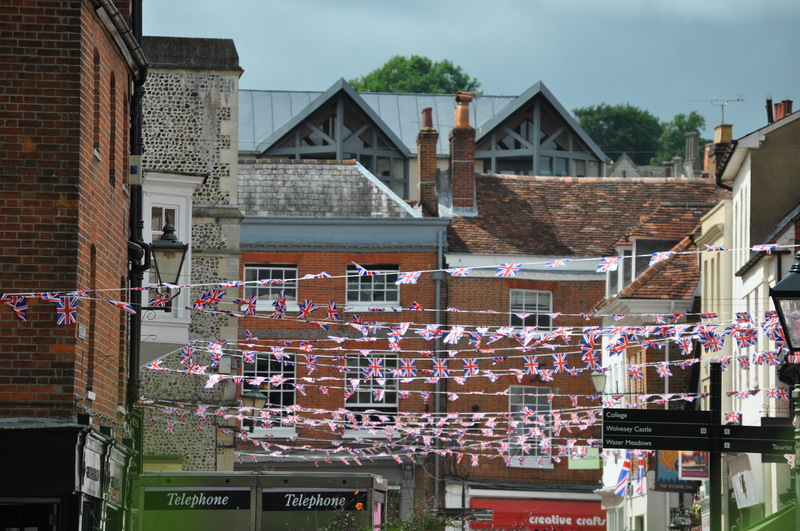 Posted in Quirks of HistoryTagged celebrations, Chawton, Diamond Jubilee, Jane Austen, street parties, Winchester, Winchester CathedralBookmark the permalink. Cool, isn’t it? Such exuberance….I’ve Facebooked and tweeted the bells of the cathedral too. Partypartyparty…. Can’t wait to see your photos, Rosemary 🙂 It’s been a nice day despite the rain. Ah, that indomitable spirit, Myfanwy 😀 The rain can’t discourage us…. Lovely, we saw the whole river thingy, but they couldn’t pick up the commentary, so slightly baffling at times. Stunning! It is fun, Sidey 🙂 Did you like Kate’s dress? Gorgeous! It would appear that everyone chose to play a part in the celebration; great photos! I just read that there are still two days to go . . . Party on!! CNN ran about about 2 hours of coverage here this morning. I’m afraid I only watched the last 20 minutes or so (and thought of you probably being out in all that rain). I’m an American, after all, and one of those who finds royalty in the 21st Century a bit difficult to comprehend. However, I remember quite well, as a 9-year-old girl, watching every minute of the coronation ceremonies on television. Princesses and queens and such were very big with me back then. It was amazing to see a real live queen in a spectacular horse-drawn carriage. A fairy tale come to life! Yes, they’re still around, PT 🙂 And while we have those who support the monarchy and those who do not, everyone seems to think the current queen a conscientious monarch. The institution has come through some sticky patches in the latter days of the 20th century, but it seems time heals. Wonderful Photos and enjoying the celebration through your eyes and lens. Thanks. Such fun recognising bits of Winchester. I love the place and all, but what made you choose it above all others as a spot to take in the celebrations? Near Jane’s house, Col. I had a day off and high tailed it straight over there. Thanks for sharing! My daughter has been fascinated with the royal family since we had an opportunity to visit a few times. Then she enjoyed a jubilee(?) while attending a summer semester in London. I’ll share these with her for sure! Thanks for keeping us posted with your posts. Also on the garden fence next to the Water. There was a picture everywhere I looked yesterday, Nancy 🙂 A golden day. Glad the feeling has come over, Debra. It’s such a party atmosphere here. Thank you, Cindy 🙂 You would have loved it…a thousand street foods to sample…. No: that is a distinct advantage, isn’t it? I know, BB. She’s had a lot of practice…. Great pictures! Must be a ton of fun there right now! I heard on CBC today that some place I can’t spell in Scotland sent the Queen the traditional lamprey pie! I can’t imagine anyone eating a lamprey! We had to disect one once in Biology class and I darn near fainted. They are the ugliest things. But, that aside, I hope you’re having a wonderful time. Can’t wait to see more photos.